Funny how an episode with lots of babies and no real violence leads right into a scene where a possessed lion monster attacks an eight year old. Sets the tone pretty nicely, actually. Matt and Tai arrive in the nick of time to save TK... and Mimi and Izzy swoop in later to save him again. This first sequence also features Devimon's Rita Repulsa moment as he makes his monster grow. Leomon gets bigger and blacker, but by now the kids have figured out the whole digivice thing and cure him that way. Things settle down after that and while the climax makes it hard to say the episode was predictable, it was certainly telegraphed. Leomon explains the concept of the digidestined in more detail: the kids were brought here to help their Digimon defeat Devimon. With the assumption that victory would send them home, there's a big collective speech about how unified the team is. I wonder if they've noticed that Joe and Sora haven't arrived yet. They do, just in time to save the whole team from a super-sized Devimon and buy them enough time for four evolution sequences. Devimon takes care of them easily and focuses his efforts on TK and Patamon. Apparently the legend says the smallest will take him down. Hmm... wonder who might be digivolving to save the day this time? This is what I mean by telegraphed. So Patamon digivolves and it is awesome. The power of the digivices fuel Angemon and give him enough strength to defeat Devimon. It's a classic moment, but watching it now makes me think of how exponential the awesome could have been if it wasn't so telegraphed. We see both of them fading away as Devimon laughs at how other bad guys will take his place while Angemon is out of commission for the foreseeable future. Imagine what it would have looked like had we actually seen Angemon struggle, finally putting every drop of energy into breaking through, clearly at the expense of his own life. They totally could have done that instead and it would have been even more epic. It's still epic though. 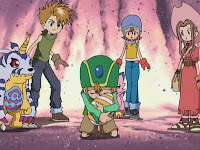 For all the buildup to Angemon's debut, it's heart-wrenching to watch TK suddenly lose his partner. Just like that, he went from having a friendly-but-meek Patamon to a badass Angemon to a simple egg. This scene alone makes me wish they had stretched this to two episodes. I wanted more reaction shots. I wanted stunned faces from the other six as they realize what TK was experiencing. Honestly, I wanted more tears. It's funny, but of everybody who loses their partner through the seasons, TK seems to handle it the best. Maybe it's because Angemon calms him down in his final words, but TK ends up putting on a braver face than Ken, Jeri or Marcus will. I don't know how I feel about that. Not saying that I want to see him get sucked into D-Reaper, but for being the first kid to lose a Digimon partner, there's far too little angst. 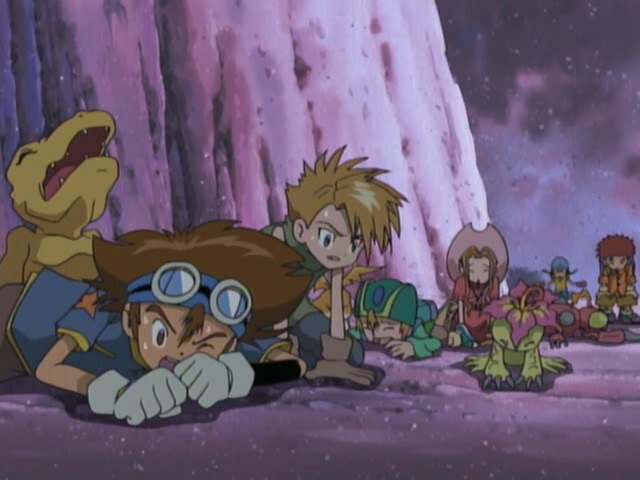 In the end, what matters is that the show went there: one of the main Digimon died. In a season defined by having so many heroic sacrifices, this is the trailblazer and deserves acknowledgment. For all the things they could have done to present it better, remember that they do so in such moments later on, and those wouldn't have happened if Angemon's death hadn't gotten the ball rolling. I should really ask what the hell's going on with Ogremon in this episode. Devimon crushes him until he turns into black gears, then he later pops out of Devimon's torso to beat back Leomon. This makes no sense! I'm not going to ask, however, because I really don't want the details about something like that. Did anyone notice that of all the kids, it's Joe and Ikkakumon that land the first blow on Devimon? For everything that happened in this episode, couldn't Gennai at least let them catch their breath before popping up? Honestly, this episode could have ended on a simple, yet ominous “we won... but we're still stuck here” tone and it would have been perfect. One thing I wonder: does Toei usually do something climatic for the 13th episode of what would become long-running franchises either in case the show bombs (thus wrapping the first arc up by episode 13) or in hopes of the show airing in the United States (where a season is usually 13 episodes)? Along with Digimon (with the Devimon storyline), this thing also happened in Dragon Ball (the conclusion of initial quest to find the Dragon Balls) and Sailor Moon (in which Usagi, Ami, and Rei finally do battle with Jadeite). It's because the series was only supposed to have 13 episodes, but high rating for the early episodes led to them extending it. It's not because it was "only supposed to have 13 episodes" - it's that 13 episodes is the test run limit for most anime or even some other cartoon shows, and given their budget at the time, the makers actually didn't think they were going to get a renewal. 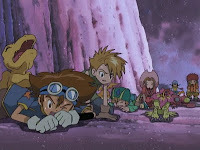 Their initial lack of faith in the show continuing explains why the opening for the entire series just shows File Island scenery, File Island enemy Digimon, Devimon, and the in-training to Champion forms of the main Digimon partners, and also why in the original version of episode 12, the battle with Devimon was hyped as being a great battle to determine the fate of not only File Island, but the entire world or something like that. Had the series not been renewed, episode 13 would have ended with Devimon defeated and the kids transported back home because they'd rid the Digital World of the evil they were chosen to fight. But due to the renewal, it ends with what was surely the original plan from the start - Devimon was NOT the source of the evil that plagued the Digital World, and thus the kids are still stuck there. I think the most impressive part of this episode is when Devimon is dying, and he actually tears apart their victory by pointing out that Angemon had to sacrifice himself to beat one of the weakest villains. Give the guy credit for originality and style rather than just "NO! This can't be happening! You can't defeat me! I'm invincible! AAH!" 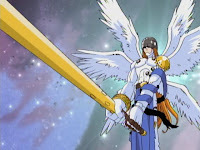 He was the strongest Digimon on File Island but one of the weaker evil Digimon created by the distortions in the Digital World and he was well aware of that, not even being afraid or ashamed to point it out to his dying foe. I always liked that about him. Part of why there's so little angst from TK could be because there was such a small amount of time between Angemon dying and regenerating as an egg. He dies, then roughly ten seconds later TK has his digiegg and a handy "Digimon don't die, just regenerate" speech to comfort him. None of the other kids who lose their partners get such quick resolution about the issue. 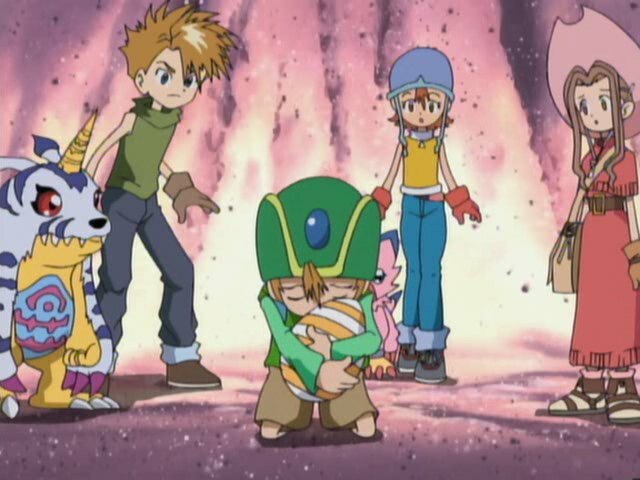 Ken was already having a bad day by the time Wormmon dies, and I don't think he even knew that Digimon could regenerate until he visits Primary Village and gets him back. Jeri...doesn't get her partner back and we all know how that turns out. Marcus was more concerned about Agumon not remembering him than anything else (I think, I admit I haven't seen Data Squad yet). And Season 2 shows that, even if there wasn't a lot of immediate angst, this incident still haunts TK years after the fact. This was quite an exciting and eventful conclusion to the File Island arc. It started off sort of rushed with all the Digidestined sans Joe and Sora meeting up at Primary Village just in time to fight off Ogremon (who was actually threatening to kill a BABY Digimon, GEEZ!) and a dark power enhanced Leomon, but the rest was paced appropriately well. Leomon's exposition shed light on the situation and why it was so imperative that they get rid of Devimon and save File Island from his evil grasp. Then we get the fight with a super-sized Devimon at Infinity Mountain and it was, for the most part, really intense. Especially when he's slowly reaching out his hand in an attempt to murder the youngest child. However upon re-watching, you do kind of realize how predictable it was that Patamon would finally digivolve in order to save the day and defeat Devimon. It's the full outcome that's a surprise, since not only would Angemon dying shock many first time viewers, but so would Devimon dying since he got built up as the show's Big Bad even in the opening. Even more surprising? He's not the source of the evil powers in this world and is in fact a small fry compared to other evil Digimon out there in the world beyond the sea. It's such a great turn of events and Gennai's surprise introduction at the end is the cherry on top.